This Did You Know story describes some of the reasons for the attractive physical features of the lake, many of which have been portrayed by famous artists such as A.Y. Jackson. The physiography of the area reflects profound geological events that can be traced back for more than one billion years. 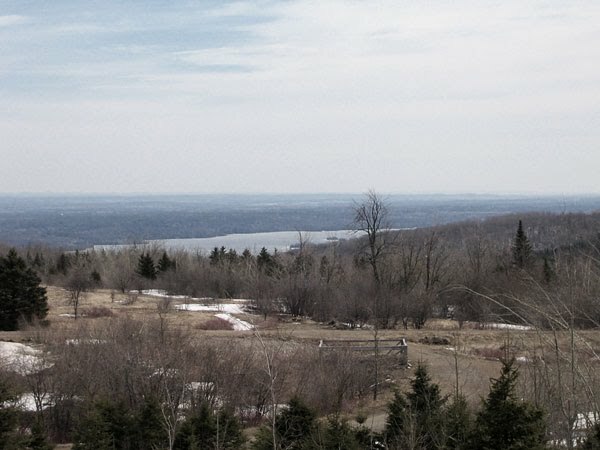 The high hills adjacent to the lake mark the trend of the ancient Petawawa fault along the western side of a rift valley running 435 miles from Montreal to near Sudbury. This rift valley was formed when the Earth's crust subsided about 1/2 mile (805m) between the Mattawa Fault (which follows the Ottawa River) and the Petawawa Fault. Just south of the Petawawa Fault, Foymount's Ryan Mountain at 1716' (523m) is the highest peak in Renfrew County. During the Ordovician geologic time Period, 510 to 440 mya age, when North America was under shallow seas, the first corals, primitive fishes and a variety of other sea life emerged which today can be found as fossils in the rocks around the 4th chute and elsewhere along the Bonnechere River (refer to: Ordovician geologic time period and at the Bonnechere Caves). During the Pleistocene Epoch (2.5 mya to 12,000 years ago) glaciers covered the area completely, leaving a significant imprint on today's landscape in the form of sandy soil, marine clay and large boulders. The margins of ancient glacial and post-glacial lakes are recorded by successive raised, step-like beaches and wave-cut terraces at various elevations. The sand and gravel around the Sand Rd. waste transfer depot is an example of glacial sand deposits. After the glacial retreat 12,000 years ago the Atlantic Ocean flooded the Ottawa-Bonnechere Graben forming the Champlain Sea. The unconsolidated marine sedimentary deposits of shell-rich sand and clay are related to this period. Remnants of salt from the sea still affects some of the wells in the region. Additional information on glaciers and the Champlain Sea's effect on the Ottawa Valley can be found on McElroy's Glaciation of the Ottawa Valley.